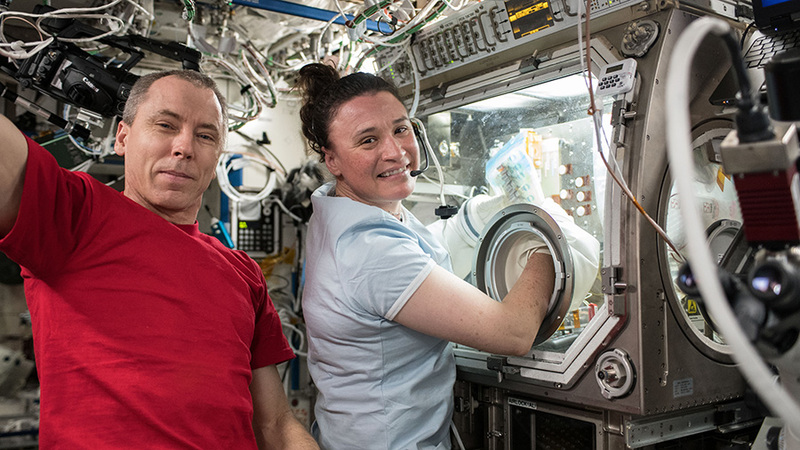 Astronauts Drew Feustel and Serena Auñón-Chancellor are seen while Auñón-Chancellor works inside the Microgravity Science Glovebox on the Micro-11 investigation. The study is looking to provide fundamental data indicating whether successful human reproduction beyond Earth is possible. A host of life science studies being returned aboard Dragon looked at cancer therapies, gut microbes, and a variety of other biological phenomena. Samples collected from those studies, including the experiment hardware housing the research, are being transferred from the station and stowed inside the Dragon. The AngieX Cancer Therapy investigation is completing its run today with NASA astronaut Serena Auñón-Chancellor finalizing research operations inside the Microgravity Science Glovebox. The experiment tested a treatment that targets tumors and the resulting samples are being stowed inside Dragon science freezers. Rodents studied for the Rodent Research-7 experiment to understand how microbes interact with the gut in space are being returned Friday. Biological samples observed in July for the Micro-11 human reproduction study are also being cold stowed aboard Dragon. SpaceX technicians will retrieve Dragon loaded with the Earth-bound cargo when it splashes down in the Pacific Ocean Friday afternoon. Once the cargo craft reaches port, personnel from NASA and the Center for the Advancement of Science in Space (CASIS) will collect the research and hardware and distribute it to scientists and engineers for analysis. Absolutly huge if those advanced research works for human’s hopers like me and more generally for human beings !!Lovely!! ISS has been wonderful. It has been emblematic of how we can cooperate as humans across difficult geopolitical boundaries. It has tought us about the effects of weightlessness on the human body, and supported much science. With a renewed focus on moving past LEO, and still relatively low budgets, maybe it is time to redeploy this space lab for an orbiting moon laboratory. Why, it would teach us how to service such a habitat farther away from earth and may serve as part of the space gate way. It is a way to get the getway underway faster and redirect the significant ISS budget to be more in line with the Exploration goals. A very slow journey to the moon would need to be studied, but it isn’t improbable that it is feasible. What is there to lose? Ad asta.